I’m on a high value load so I’ll post more about my whereabouts in a few days. 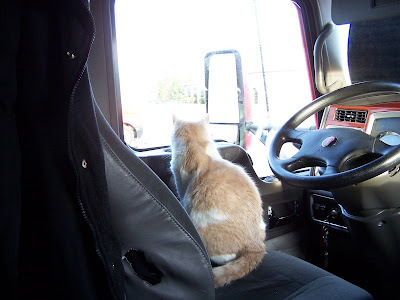 I’m okay, truck is okay, guard cat is on duty. I guess I wasn’t finished after all. About five minutes after I pulled into the local truck stop I get a message on my satellite unit to deadhead down to El Paso, TX. They wanted me there by 6 PM, but my 14 hour clock runs out at 3 PM so I’ll do the rest in the morning. Got up at 1 AM this morning in Denver and made my way down to Albuquerque without incident. 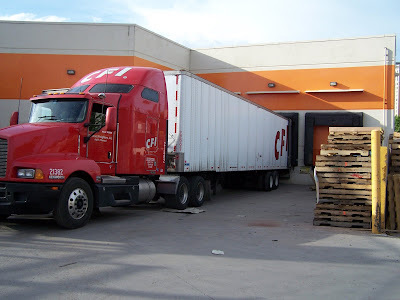 Since I missed my original appointment time the workers at the Sam’s Club had to work me in around other trucks. Three hours later I’m done and after a quick hike to the nearby Walmart to restock, I drove over to the closest truck stop to await further orders. 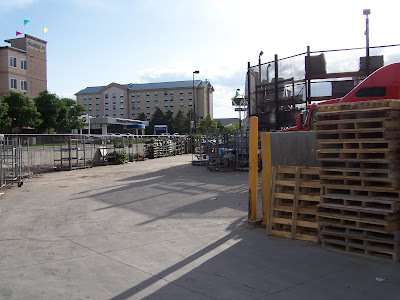 I made it up to the Pepsi plant in Denver ahead of schedule and after two-and-a-half hours they had me loaded, bill signed and seal on the trailer. It had been raining on and off for an hour or so and as I left it intensified quite a bit. 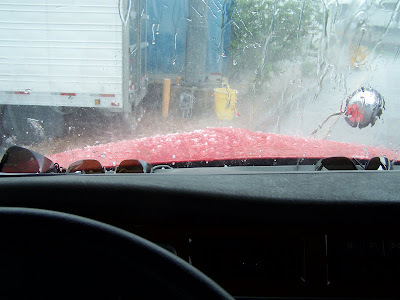 I drove just over a mile down the freeway to our fuel stop, a Pilot, and by the time I got there the sky was just dumping rain by the bucket. There was probably 3 or 4 inches of rain in 20 minutes on the ground, along with a heaping helping of hail. All this while I’m trying to fuel and get my load scaled. Suffice it to say I was soaked from head to foot. The Pilot is next to I-70 and it flooded over badly, bringing traffic to a stop. Truckers reported standing water over a foot deep on the interstate, and there were some collisions as well. Because I started my day at 10 AM today, I can’t work past midnight. Between the deadhead up here, the long load time, fueling, scaling and the storm I won’t be able to make Albuquerque before my 14 hour clock runs out and I will have to take a break. So, my 2 AM appointment goes by the wayside. Our crack team at HQ are on the case and will let me know. UPDATE: I will be staying put for the next ten hours then heading out very early to deliver in Albuquerque around 10 AM, weather allowing. Odd sighting: I saw not one but two snow plows roll by on I-70. Its almost June. I delivered at the second Home Depot late last night. For some reason this dock was a blind side back as well, but it was easier to get in to due to more room in front of the dock. The manager liked the fact that I was early (due to arriving early at my previous stop) so they could finish up and go home. Afterwards I made my way about ten miles north to our authorized fuel stop in the area. After taking the offramp, I set up for a left turn only to find the underpass was a 13′ 9″ tall single lane! Just as I arrived another truck was entering the other side so I backed up and let him through. 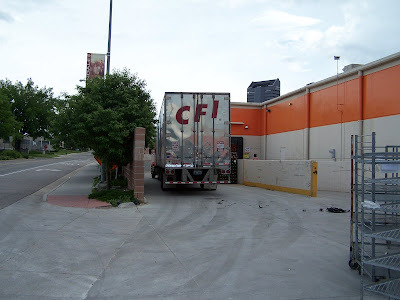 It was a bit nerve wracking making a wide enough turn to make sure the trailer didn’t scrape as I entered, but eventually I got through to the other side and found a spot to shut down. This morning I got assigned a load of Pepsi products going from Denver to Albuquerque. I have to retrace my steps almost exactly from yesterday — the place I’m picking up is a few miles from the Home Depot I first delivered at. The satellite system warns me it will be a heavy load, which is unfortunate given I’m in Colorado and will be going to New Mexico. Lots of hill climbing today. I decided to try arriving early and made my way about 20 miles from Aurora, CO in towards the southern part of Denver. I got here at about 5:15 PM and by 6:00 PM they told me I could have the middle dock. The only problem is, the entire back area of this store is full of plants, empty racks, pallets, you name it. 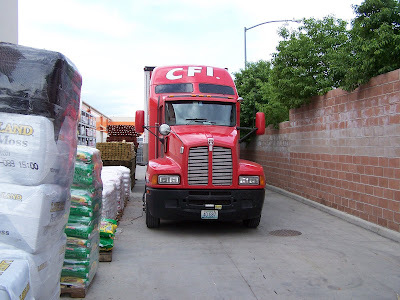 You have to enter from the rear of the store in a very narrow opening, then follow a small lane around the periphery, then do a very tight blind side back into the dock area, all while dodging the pallets and racks strewn about. I’m glad I got here before nightfall… the warehouse guy complimented me on my backing, too. Well apparently I will not be unloading early… and I forgot to mention these are both “driver assist” unloads, where I get my hands dirty helping them get the cargo off. “Fingerprinting” as it is called in the industry. I’m parked at the Flying J in Aurora, CO which is the nicest truck stop in the greater Denver area BY FAR (at least as compared to the two T/A’s, the Pilot and the Sapp Bro’s on the north side). Very nice facilities, great parking, and I had a heckuva nice dinner last night at the restaurant. Plus, there is a Walmart superstore across the freeway from here so I might drop by there tomorrow to get stocked up before I go deliver.